Ideal for hunting medium and big game at most distances. Trophy Bonded Tip combines bonded construction and a bone-crushing solid copper shank with a boat tail design and polymer tip for top penetration and expansion. Order this Federal Premium® ammo today! 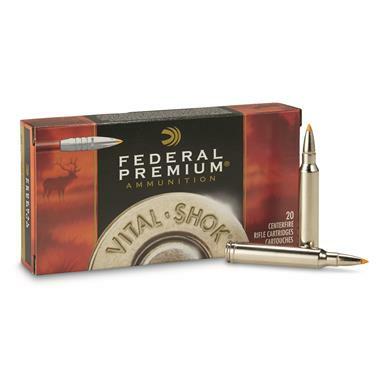 Federal Premium, .300 Win. Mag., TBT, 180 Grain, 20 Rounds is rated 4.5 out of 5 by 63. Rated 5 out of 5 by hunter840 from Great accuracy and single shot kills I have been using these rounds in my Browning X-Bolt stainless stalker for the last few years and have had nothing but great success. I have experience one shot kills in last years cow elk and this years buck mule deer. Both bullets were recovered on the opposite sides just under the hide, with great mushrooming and weight retention. I finally had to buy a new box after 3 years due to putting a new scope on the gun and getting it sighted in. I have noticed reduced barrel fouling after switching over to these rounds as well. Great product. Rated 5 out of 5 by AfricanEclipse from Excellent Africa Bullet Planning for a safari takes a lot of time and effort. To make it worth while I needed a hearty 180 gn bullet for my 300 WM. This round was recommended by various sources as African plains game are tough and sometimes pretty big. As it turned out this bullet performed magnificently on small critters such as a side stripped Jackal at 50 yrds out to 225 yrds on a large Waterbuck. The longest shot made was at a Bushbuck at 296 yrds. A baboon was dispatched instantly at 165 yrds. Out past around 350 yrds shot placement becomes more of a necessity as expansion and subsequent hydrostatic shock decrease with velocity. Three bullets recovered from game at 70, 90, and 225 yrds retained at least 80% mass. TBTs are what to take for hearty game!